Searching for an easy-to-make slow-cooker chicken recipe? 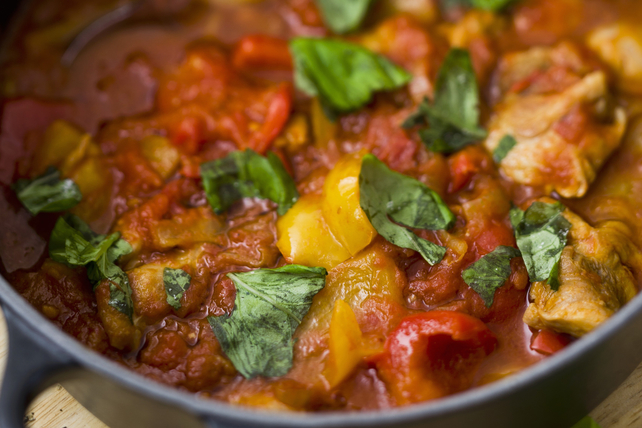 Our Slow-Cooker Chicken and Pepper Stew is sure to be a hit with family and friends alike. Try serving it over hot cooked rice, mashed potatoes or quinoa. Place chicken in slow cooker sprayed with cooking spray; top with onions and garlic. Combine all remaining ingredients except sweet peppers, cheese and basil. Add to slow cooker; stir. Cover with lid. Cook on LOW 5 to 7 hours (or on HIGH 3 to 4 hours), stirring in sweet peppers for the last hour. Stir in cheese just before serving; sprinkle with basil. Top with 1/3 cup crumbled cooked bacon just before serving.